For the past couple of years, I’ve tended to finance purchases of the latest and greatest pieces of hardware with sales of my old hardware. 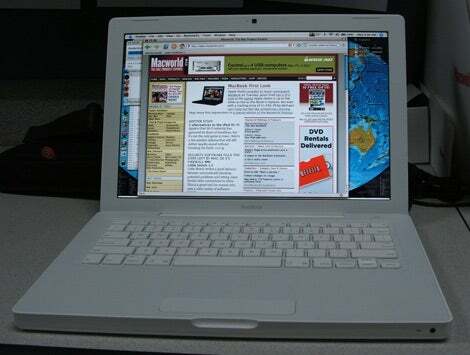 In 2004, I did it by selling my PowerBook to buy an iBook. In 2005 I pulled it off by selling my third-generation iPod to finance an iPod nano purchase. And Tuesday afternoon, I did it by selling my iBook to buy a brand-new MacBook. Using the MacBook has been my first extended exposure to an Intel-based Mac. And, thus far, I’ve been pleasantly surprised to learn that nearly all of the applications that I use on a daily basis are now available in Universal Binary form so that they run natively on Intel processors. Given what we went through during the OS 9-to-OS X transition, I expected it would be a while for to happen. But Fire, NetNewsWire, Firefox, Thunderbird, Skype, Azureus, VLC, XJournal, and Chicken of the VNC can run natively on the Intel Core Duo chip that powers my MacBook. Even the shareware I use has made the transition. Now, if only the Adobes, Digidesigns and Microsofts of the world would follow suit, everything would be complete. With the issue about the availability of Universal apps put to rest, my next concern involved the size of the MacBook. 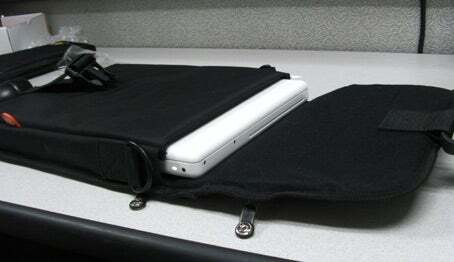 My old iBook sported a 14-inch screen; I wondered if the loss of that one inch would make any difference. It doesn’t seem to. In fact, you can see below how the MacBook fits quite nicely into the Booq PowerSleeve12 —only sticking out a little bit, but not enough to prevent the bag from closing. The extra resolution is quite nice too, as it allows me to have a good-sized browser window while keeping an instant message client open on the side. Talking about the MacBook’s glossy screen in the latest Macworld Podcast, Jason Snell predicted: “Some people will love it, and some people will hate it.” Certainly, a contingent of people aren’t fans of the MacBook’s glossy screen, but count me among the users who love it. Yes, in lower light it can produce a glare when looking at the screen from off-center. But honestly, who uses their computer off-center? And yes, it makes the screen difficult to see while outside. But again, who actually does that? I could hardly see the screen on my old iBook when I was outside anyway. In any case, the screen is noticeably brighter. I haven’t measured it by candlepower, but it just seems to ooze shiny colors. I’m also a big fan of this MagSafe Power Adapter. Not only is it longer than previous AC adapters, but the new magnetic technology is just practical. You barely touch the cable to make it disconnect. The keyboard is a pleasure to use as well. The keys are more spaced out and are generally quieter from my experience. It just feels cleaner—but maybe that’s the newness of an Apple product rubbing off on me. 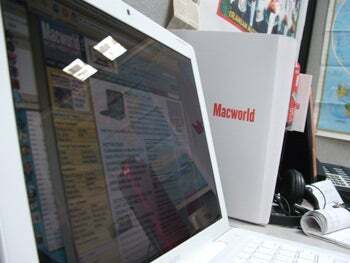 I was also thrilled to read on MacUser that the screen doesn’t actually touch the keyboard when it’s closed. Maybe now my screen won’t get all grubby and grimy with lines from the keyboard keys and other things. Finally, I love the packaging. Sleek, efficient and clean—much better than the monstrosity that was the previous box. However, I couldn’t find any Apple decals. Correct me if I’m wrong, but didn't the previous iBooks come with decals? All in all, I couldn’t be happier with my new MacBook. The laptop even comes with standard features—such as Bluetooth and a built-in iSight camera—that used to be available only to higher-end users. By this time next year, who knows? Perhaps I’ll be finally able to afford a MacBook with a DVD burner and in black.